← READY TO ENTER THE CORRIDOR? 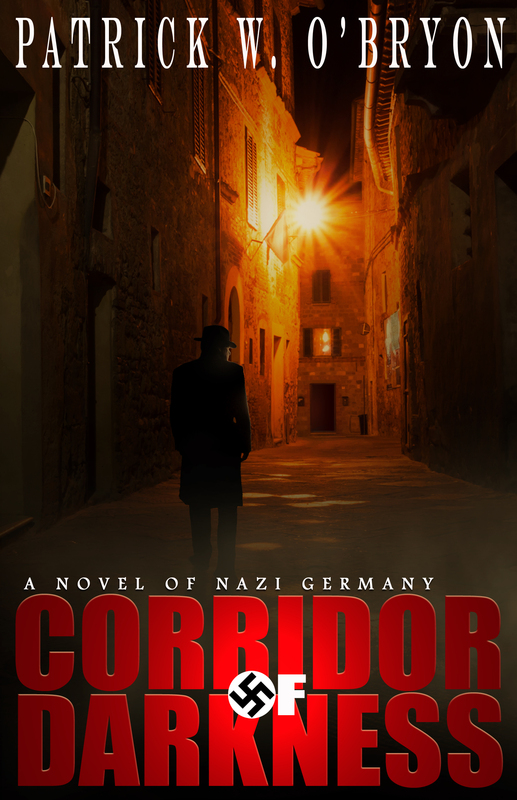 On the virtual bookstore shelves at last…CORRIDOR OF DARKNESS, a Novel of Nazi Germany, now available on both Amazon.com and CreateSpace.com as a trade paperback. Coming soon to other on-line outlets such as Barnes & Noble, as well. Three years in the writing, offering 362 pages of intrigue and espionage, all from a guy who knows so little about using Microsoft Word that this proves miracles can happen. The eBook Kindle edition will follow in a day or so, delayed by a technical error. (That also means me.) I’ll announce its arrival soon. 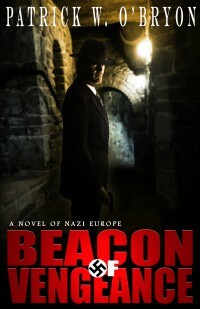 http://www.createspace.com/4504054, which takes you directly to the book. I hope you enjoy reading it–thank you for supporting me in this venture. Share your thoughts by leaving your comments here on the blog, or by posting a review on Amazon once you’ve read the book. Please spread the word to all your reading and blogging friends, and watch for an announcement of the book’s launch party coming November 21st. And Volume 2, BEACON OF VENGEANCE, is underway, due November 2014! This entry was posted in Historical Thriller, Uncategorized and tagged 1930's Berlin, 1930's Germany, Beacon of Vengeance, Berlin, Espionage, Gestapo, Historical Novel, Hitler, Nazi Germany, Nazi Thriller, Nazis, Spy Tales, Suspense, Suspense thriller, Treachery, Weimar Republic, World War II, WWII Spy Yarn. Bookmark the permalink. 8 Responses to CORRIDOR OF DARKNESS NOW AVAILABLE ON AMAZON! 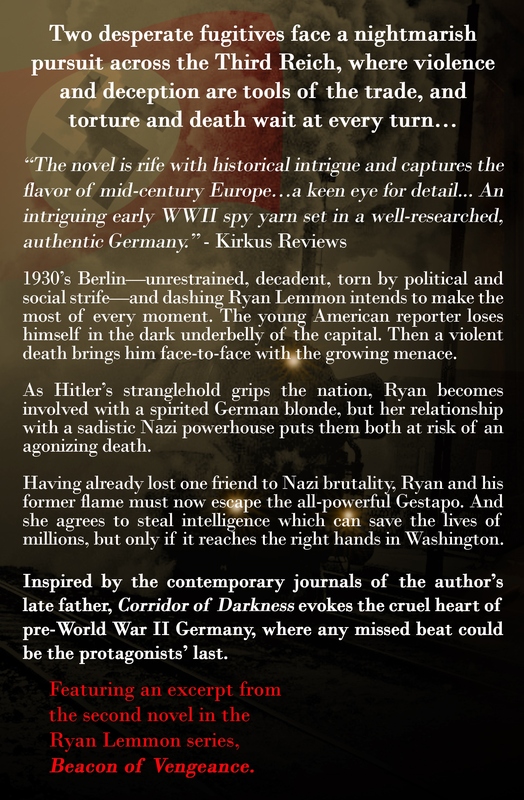 Patrick W. O’Bryon’s book, “Corridor of Darkness” a novel of Nazi Germany is now available on Amazon. Thank you!! You know the feeling when you finally have that book in your hand. Thank you so much for re-blogging, too. I’m new to the marketing side of this, so appreciate all the help I can get. I’ve been looking forward to this and can’t wait to buy and read!!! I haven’t read this yet, but I’ve read enough of Patrick’s blog to know that this book is going to be good. If you have the chance and a few dollars in your pocket, you should check it out. Thanks for your kind comments, Mark. If I can just get the Word indents straightened out on the Kindle version so they’re not hopping all over the place, it’ll be available soon too. Thanks for the reblog! I loved these two books!!! When is the next Ryan Lemmons book coming out? So nice to hear you are enjoy Ryan Lemmon’s European challenges! Fulcrum of Malice, now in the editing stage, is running a bit late but should be out in early fall. Hope you enjoy it, as well!